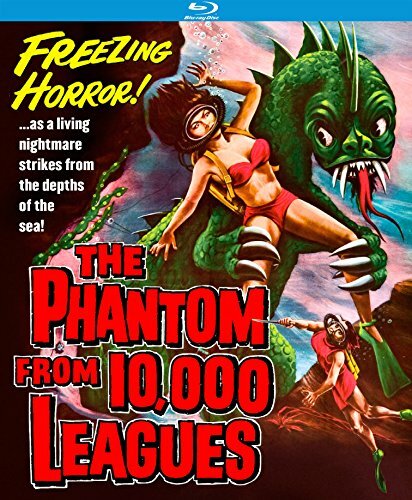 Synopsis: Before there was Jaws or Orca The Killer Whale there was Phantom From 10,000 Leagues (1956) - the mother of all monsters from the deep! This classic 1950's science fiction feature was a huge hit at drive-in theatres and aquariums across America! When a scientist tries to create a radioactive death ray, the experiment backfires causing a small turtle to revert to a giant prehistoric size monster. Dr. Ted Stevens (Kent Taylor, The Crawling Hand) meets a government investigators, at the scene of another beach murder caused by this hideous sea monster, while marine biologist Professor King (Michael Whalen, The Dawn Express), who created the monster in his laboratory, is being pursued by a beautiful femme fatale who is blackmailing or killing everyone in sight in an effort to acquire King's top secret files for the Russians. Directed by veteran Hollywood editor Dan Milner (From Hell It Came), his second of three directorial efforts.